GAUNERSHRED – Postboned! ->> 24.11. The „Gaunershred“ by Shredlife e.V. on Saturday, 27. October >> NOVEMBER 24th! 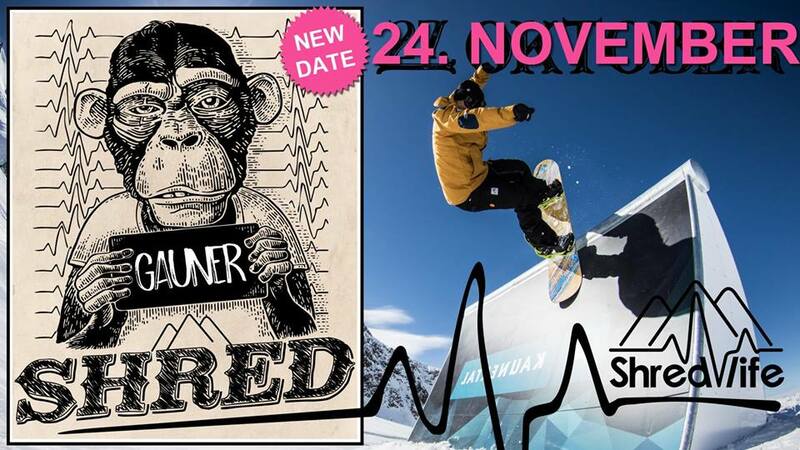 With the first tourstop ot the brandnew Freeski and Snowboard Slopestyle tour by Shredlife e.V., the „Gaunershred“ going down Sat, 24h of November is building one of the highlight events of the #FALLRUNS 2018 season at Snowpark Kaunertal! Shredlife e.V. is organizing a new contest tour for young and old snowboarders and freeskiers starting this Season 2018/2019. While the tour is especially promoting young talents in these sports it is also focusing on the common passion for the “Shred” in all ages by giving a platform to compete! The stage for the premiere of the first tourstop “The Gaunershred” on Saturday, November 24th will be the Snowpark Kaunertal in Tyrol! On a special slopestyle course the participants of both disciplines Freeski and Snowboard in the category’s U12, U15, Men and Women are battling each other to title the “Gauner of the Day”! All sporty ambitioned freeskiers and snowboarders off all ages, levels, origins and genders are very welcome to register right on- site between 8:30 and 9:30am at the plateau in front of the “Restaurant Weissee” at the glacier! After a short “Riders Meeting” where the timetable and contest format is explained to the participants it’s time to start over into the Jam Session! Surrounded with BBQ and chilled beats the day at the glacier will become an unforgettable one! Goodies and prices from the tour partners Picture Organic Clothing, TSG International, Schneeverliebt, Holmenkol, SWOX Surf Protection, Eizbach, Deeluxe Snowboardboots a.m.m., as well as the chance on the award „overall tour winner“ are waiting for the lucky winners.